Raptor Resource Project Blog: What is infrared light, and why can't eagles see it? What is infrared light, and why can't eagles see it? We are starting to get a lot of questions about the night-time illumination of the nest, so I thought I would write a little bit about visible light, invisible light, and our IR illuminators. What we see - the world of visible light - is just a tiny fraction of all the types of light that exist. 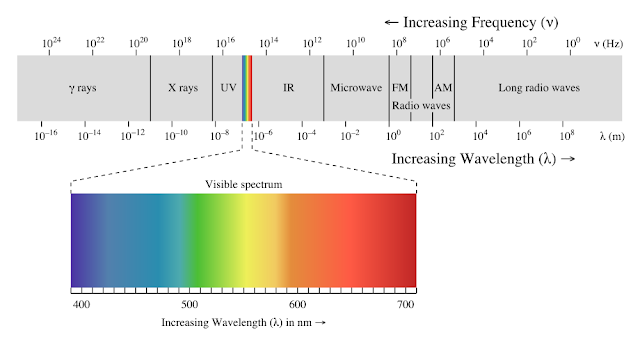 Infrared light, gamma rays, X-rays, ultraviolet light, microwaves and radio waves are all types of invisible light. Like visible light, they are different because the length of their waves is different. Birds have very different eyes than we do. 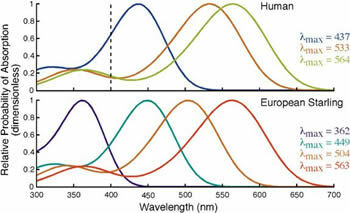 They have four color cones instead of three, more cones and rods to see color and light with, a higher proportion of cones to rods (at least in diurnal birds), and different peak sensitivities to light. As the graph below illustrates, we have narrower spectral sensitivity than birds and are much less sensitive to certain wavelengths of light. However, like humans, birds do not see above about 700 nanometers. While some birds range into UV, IR light is as invisible to them as it is to us. So how can we use an IR illuminator to see the birds if we can't see IR light? Researching and writing about this stuff makes me want to read a trashy romance novel, but I'll put that aside for now and forge ahead. Here is how it works. 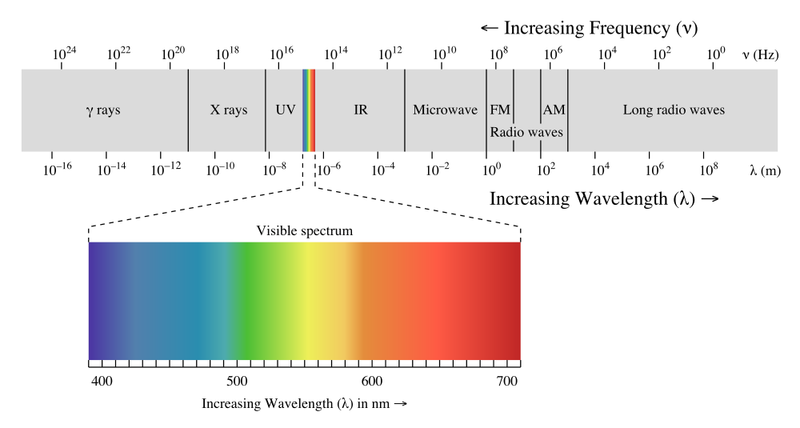 The IR spectrum starts at about 780 nm. The LED IR illuminators used on our camera emit 'invisible' light at a wavelength of 850 nm: well above the 700 nm visibility limit we share with birds, but well below the high-energy 'hot' end of the spectrum. LED illuminators are also smaller and have lower requirements and range than bulb-type illuminators. The camera and illuminators are located roughly five feet from the eagles. The illuminators shine IR light on the nest. The IR sensor detects the light and focuses it onto a CCD (Charge Coupled Device) imager chip, which has a spectral response of up to roughly 1,000nm. The chip maps IR wavelengths of light down into the visible spectrum via tiny electric charges generated by IR light falling on to an array of tiny sensor cells. Since the photo-sensitive cells don't distinguish between colors, the camera generates a monochrome image. I suspect it is really a LAB color space, but that is far outside the scope of this discussion. If you feel really nerdy, follow this link to learn more about LAB color spaces. There is a lot more to color than RGB, even for us trichromates! http://en.wikipedia.org/wiki/Lab_color_space. Can the eagles hear or see the PTZ camera? The cameras use servo motors to drive the camera along a 360 degree path, which minimizes the amount of time and work it takes to arrive at any given destination. These motors are very quiet - the camera was designed for surveillance - and encased in hard plastic. I suspect that the eagles can't hear the servos; certainly, we don't hear the servos and the microphone is much closer to the camera than to the eagles. If the eagles can hear the servos, the sound is not any more alarming to them than the other noises that make up their sonic landscape - traffic on the nearby road, people at the fish hatchery, wind, tree branches, the brook, the horses, and so on. Although the young eaglets went through a period last year of seeming quite fascinated by the camera - we wondered if they were interested in their reflections - the eagles ignore it generally. Since it rotates around a 360 degree axis, there does not appear to be much movement (think of a spinning top) and the camera is behind a dome, which helps conceal it. If the eagles can detect movement, it isn't bothering them. Again, a lot of things around them move. Since the camera isn't trying to eat or threaten them, it doesn't really concern them. Mammals and birds can't see IR light - to the eagles, the nest is dark at night - but our camera can. We use low power IR illumination devices that are roughly five feet from the eagles. They are not hot and do not emit dangerous radiation or noises. A chip inside the camera does the work of converting the IR image into visible light via tiny electric charges. However, because the chip does not detect color, the image is monochrome. To see IR light for yourself, take a television remote, which works via IR. Press a button and look at the LED on the end. You won't be able to see anything. Now, take a digital camera or phone camera (I used an Android HTC), point it at the remote to take a photo, and press a button on the TV remote. You should now, through a digital device with a higher spectral sensitivity than either we or the eagles have, be able to see the infrared light. Like our camera, your camera uses a CCD chip that maps IR down into visible light for humans. But neither we nor the eagles can see IR without technological assistance. Again, the nest is dark at night. Personal communication with Travis from 2mcctv, aka our camera salesman. Thanks, Travis! My husband Ken, who came up with the real-world experiment. We have Pip in Decorah! How big is the Decorah Bald eagle nest?